Figure 2: The sodium potassium ATPase pump is a very hard working pump that uses alot of energy. Its job is to exchange sodium on the inside of the cell with potassium on the outside. It can do this well and can create a gradient of 140 mmol for each cation across the membrane. Both sodium and potassium can however leak through the cell membrane, sodium back into the cell and potassium out. Hydrated potassium is smaller than hydrated sodium so the potassium leaks fastest. Overall there is a net movement of more sodium out of the cell then postassium into the cell. This leads to the generation of an electrical gradient across the cell membrane with an excess of positive charge on the outside of the cell. The main compartments are the intracellular and extracellular compartments. Plasma and interstitial fluid comprise the extracellular compartment. The main difference between plasma and intertstitial fluid is that there is very little protein in interstitial fluid. This is the basis of Starling's law of the capillary as the capillary endothelium is largely impermeable to protein. The Na/K ATPase pump is on the cell membrane, see figure 2. It pumps sodium out and potassium into the cells. It can establish a gradient of 140 mmol between the concentration of sodium inside and outside the cell. The cell membrane is permeable to sodium and potassium but potassium moves quicker (because hydrated sodium is larger than hydrated potassium). This difference in permeability of these ions results in an electrical gradient across the cell membrane with an excess of negative charge on the inside of the cell. The effect of this pump is that sodium is in the main found outside cells while potassium is on the inside. In electrolysis the cathode is the negative electrode and the anode the positive electrode. Ions that are attracted to the cathode are therefore positive ions and those that are attracted to the anode are negative. 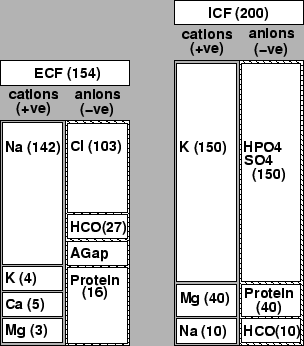 The main cations are Na and K and the main anions are Cl and HCO . Figure 3: The diagram shows the normal compostion of the ECF (plasma) and ICF. The main cation in plasma is sodium and that in ICF potassium. The anion gap is sodium - (chloride + bicarbonate) and corresponds to the anion contribution of phosphate and sulphate. It is normally about 142 - (103 + 27) = 12 milleequivalents. If increased it indicates that there is extra acid in the blood eg. lactate. The difference between interstitial fluid and plasma is that there is less protein in the interstitial fluid (about one milleequivalent) and the difference of 15 milleequivalents is made up by corresponding increases in chloride and bicarbonate. The major anions in the ICF are phosphates and proteins. As the proteins cannot pass through the cell membrane, chloride is preferentially shifted to the ECF from the ICF and is the main anion in the ECF. One mole of substance is the molecular weight in grammes. A mole of any substance contains the same number of atoms (Avogadros constant). A molar concentration is one mole in one litre. There are one thousand millemoles in one mole. Similarly when the concentration of a substance is expressed as millemolar then there is one thousanth the concentration of a molar. Monovalent ions have one charge (eg. Na and Cl ). These ions will combine on an equimolar basis . Some ions are divalent (eg. Mg , Ca ) or even trivalent. The combination of a monovalent ion with a divalent ion will not occur on an equimolar basis. For each mole of the divalent ion two moles of the monovalent ion are needed. . To overcome the difficulties in presenting the concentrations of the many anions and cations in the various fluid compartments and to ensure that the total number of anions corresponds with the total number of cations values are usually presented as equivalents or milleequivalents. One milleequivalent of Na is the same as one millemole of Na . However, one millemole of a divalent ion such as Ca is the same as two milleequivalents of Ca . The composition of the plasma, interstitial fluid and intracellular fluid is summarised in figure 3.